Jurassic Park – no thanks! December 03, 2013, 5:26 p.m.
Last week scientists confirmed soft tissue found in a 68 million year-old fossilised Tyrannosaurus rex (T-rex for short) is indeed genuine, having previously believed it was impossible for tissue to be preserved for such a long period. Fresh evidence into the effect of iron on the preservation of tissue raised the prospect of gaining access to T-rex DNA and everything that comes with it. Despite wild speculation – the prospect of creating free roaming dinosaurs in the near future remains incredibly unlikely – scientists are however seriously considering bringing back to life woolly mammoths using DNA fragments found in fossils. 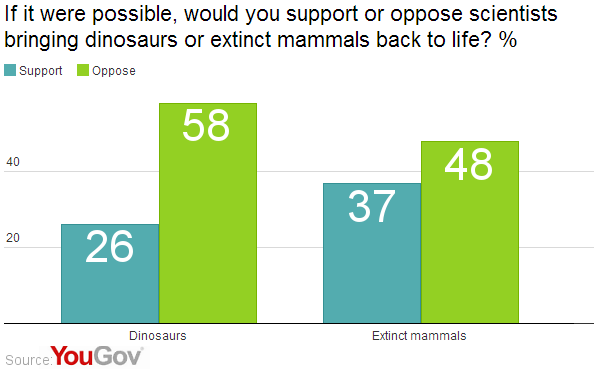 Around one in six (58%) oppose the idea of bringing dinosaurs back to life; with only around one in four (26%) in favour and a further 16% don’t know. Bringing back mammals such as the woolly mammoth (only extinct for around 4,500 years) gains more support from the public, 37% support bringing back to life extinct mammals with 48% opposed. There is a significant gender gap in the results, with men (36%) more than twice as likely to want to bring dinosaurs back to life than women (16%). Men are more likely to support bringing extinct mammals back to life than oppose it, with almost half (47%) in favour, compared to just 27% of women. 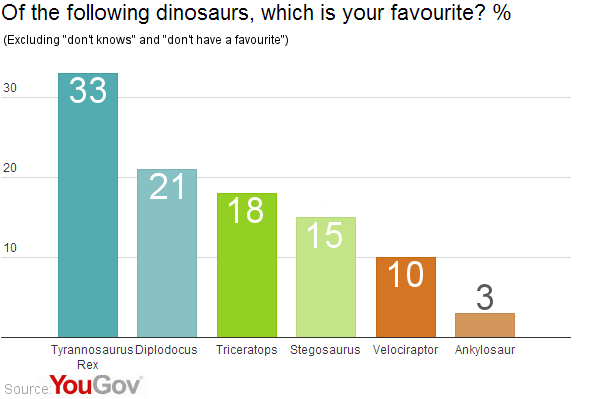 Despite there being little appetite for its revival, the Tyrannosaurus rex is the country’s favourite dinosaur – picked by a third (33%) of the public with an opinion, followed by the Diplodocus (21%), Triceratops (18%) and the Stegosaurus (15%). Even if most people don&apos;t want to bring them back to life, dinosaurs remain a global fascination to this day: the original 1993 Jurassic Park was the highest grossing film of all time until it was surpassed by Titanic in 1997, whilst the 3D re-release – released in August 2013 to commemorate its 20th anniversary – grossed over $100m (£61m) worldwide.